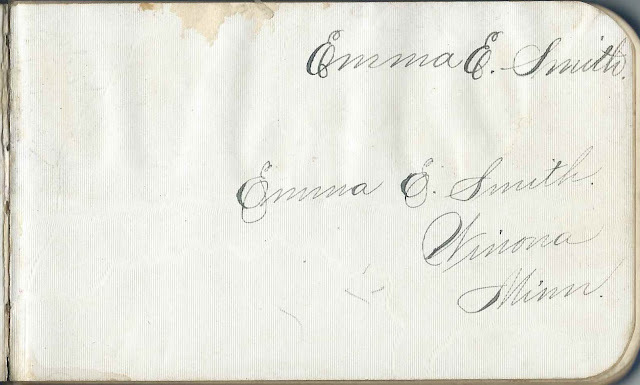 1880s autograph album that belonged to Emma E. Smith of Winona, Minnesota. The album apparently came to light years later as one of the last pages contains the writing or one or both of Emma's children with husband Henry A. Stillinger. 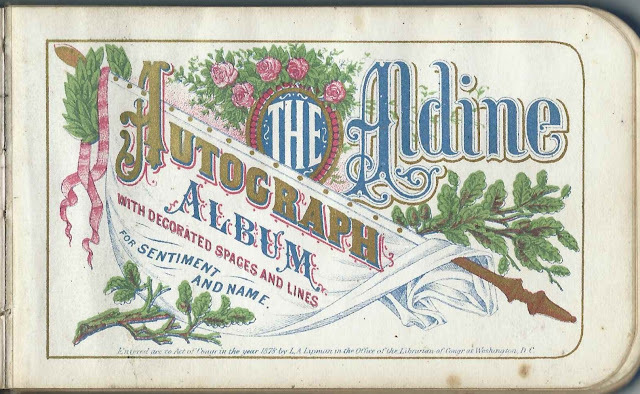 The album measures approximately 5-1/4" by 3-1/4" and contains the sentiments of over 50 of Emma's relatives, friends and teacher, Sarah H. Strong. An alphabetical surname list and an alphabetical list of the inscribers, together with any personal information they offered, appear at the end of this post. According to Census information, Emma E. Smith was born about 1865, though her gravestone shows 1872. Her parents were Alvah Samuel Smith and Sarah Sophia (Richardson) Smith, who were born in New York and Ontario, respectively. 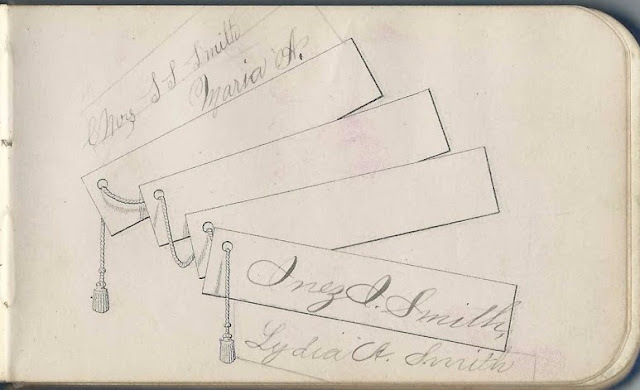 Emma's mother and three of her sisters, Maria Alice Smith; Inez Irene Smith and Lydia Augusta Smith, inscribed a shared page in the album. One inscriber, Ella M. Peckham of Winona, Minnesota, called herself Emma's cousin. 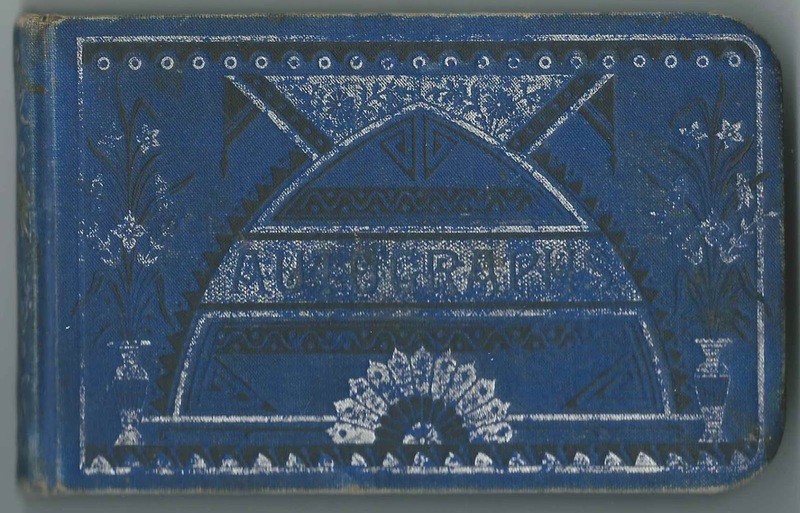 It appears that that Emma visited New York in 1886, as several people from the Williams family and H. G. Hall inscribed pages at Rushford, New York in that year. Perhaps she met her future husband on this or another trip. About 1895 Emma married Henry A. Stillinger, a New York native whose parents had earlier emigrated from Germany. Emma and Henry had at least two children, Clyde Smith Stillinger and Edna Claribel Stillinger. According to Find-a-Grave, Emma died in 1919, Henry in 1952 and Claribel in 1954; they're buried in the Buffalo Cemetery at Cheektowaga, New York. Clyde outlived them by many years. Nettie Pennoyer; inscribed at Winona, Minnesota. Mrs. S. S. Smith; Emma's mother Sarah Sophia (Richardson) Smith; on a page shared with her daughters Maria A.; Inez I. Smith and Lydia A. Smith. Maria A.; Emma's sister Maria Alice Smith; on a page shared with their mother Sarah Sophia (Richardson) Smith and sisters Inez Irene Smith and Lydia Augusta Smith. 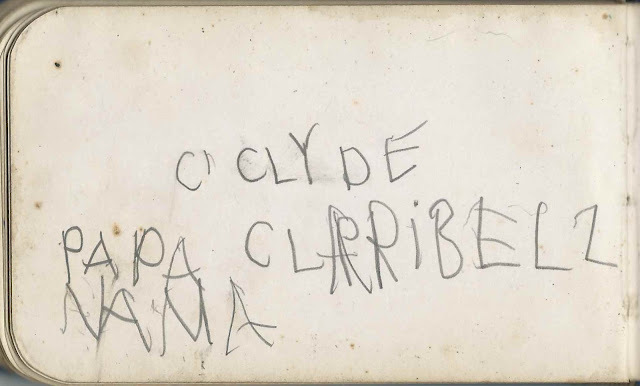 Claribell; written along with names Clyde, Papa and Mama. 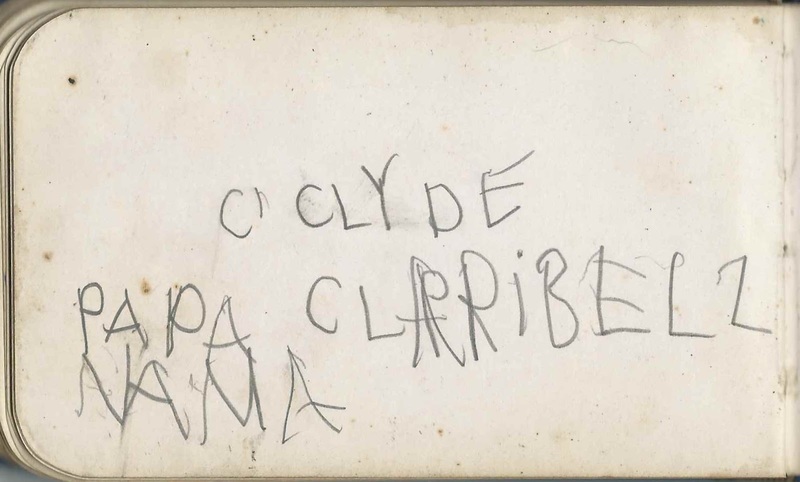 Either Edna Claribel Stillinger or Clyde Smith Stillinger inscribed this page. They were Emma's children with husband Henry A. Stillinger. Sarah H. Strong; inscribed at Winona, Minnesota, on January 5, 1881. Emma's teacher.